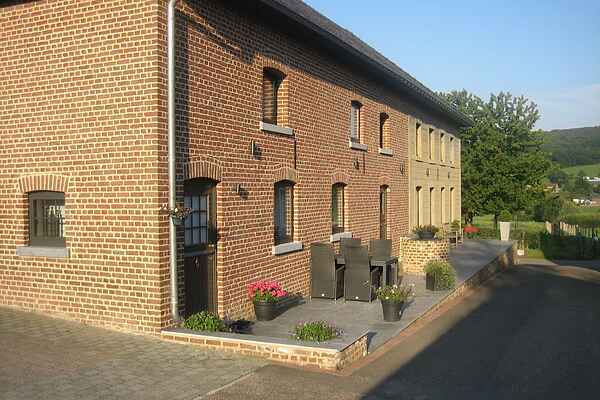 This comfortable holiday home is located on the edge of the village Epen in South Limburg. You have open views on the Geul valley and the Vijlener forest from the terrace in front of the home. The garden of the holiday home is at the back of the house at approx. 25 m distance. You can really relax and enjoy the tranquillity and the beautiful views on the hilly landscape here, while the children can jump around on the trampoline. The centre of the picturesque village Epen is approximately 200 m away and offers various amenities such as restaurants and bars, a supermarket and a bakery. Hilly South Limburg offers a great diversity of cycling and walking paths. After an energetic hike in the hills you can enjoy the fabulous panoramic views before having a rest on one of the many terraces. The location near Maastricht, Belgium and Germany offers ample possibilities for various excursions. Pay a visit to cosy Valkenburg (16km), atmospheric Maastricht (25km), the Drielandenpunt (Three countries crossroad) in Vaals (13km) or the historical German city of Aachen (17km).